The Sherman Antitrust Act, passed by the United States Congress in 1890, authorized the federal government to institute proceedings against trusts in order to dissolve them. Congress passed the act because of concerns about putting too much economic power in the hands of a few large businesses. The act was based on the constitutional power of Congress to regulate interstate commerce. Under its constitutional authority, the act effectively declared illegal every contract, combination (in the form of a trust or otherwise), or any conspiracy in restraint of interstate or foreign trade. A fine of $5,000 and imprisonment for one year were set as the maximum penalties for violating the act. Today, a criminal violation of the Sherman Antitrust Act is a felony punishable by imprisonment for up to ten years and fines not to exceed $1,000,000 for individuals and $100,000,000 for corporations. Damages awarded to plaintiffs in civil actions are automatically tripled. Initially, enforcement of the act was prevented due to adverse Supreme Court rulings. However, because of President Theodore Roosevelt's "trust busting" campaigns, it began to be invoked with some success. In 1904, the Supreme Court upheld the government in its suit for dissolution of the Northern Securities Company. The act was also used in 1911 by President Taft against the Standard Oil Trust and the American Tobacco Company. During the era of the Wilson administration, the Clayton Antitrust Act (1914) was enacted to supplement the Sherman Antitrust Act. The Federal Trade Commission was also established in 1914. During the 1920s, antitrust actions declined sharply. Antitrust actions were vigorously resumed during President Franklin Delano Roosevelt's administration. Since that time, there have been periods of relatively little antitrust action on the part of the federal government and periods of rather active pursuit of antitrust activity. 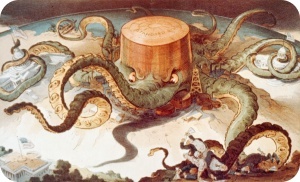 The basis for antitrust actions against the real estate industry is primarily based upon Section 1 of the Sherman Antitrust Act which provides, "Every contract, combination in the form of trust or otherwise, or conspiracy, in restraint of trade or commerce among several states, or with foreign nations, is declared to be illegal." The statutory term "conspiracy" means that two or more separate business entities participate in a common scheme or plan that restrains trade. In 1950, the United States Supreme Court in the case of The United States v. National Association of Real Estate Boards (NAREB) held that the concept of "trade", as applied in the Sherman Antitrust Act, included real estate brokerages. It also determined that any fee schedules promoted and enforced through a real estate board via disciplinary proceedings violated Section 1 of the Sherman Antitrust Act. Outside of the 1950 decision noted above, until 1980, the real estate profession had little contact with the federal Sherman Antitrust Act. However, the 1980 decision handed down by the United States Supreme Court, McLain v. New Orleans Real Estate Board, made it clear that the actions of real estate professionals and the professional organizations to which they belong are subject to the prohibitions and requirements of the Sherman Antitrust Act. The court specifically held that a conspiracy to fix real estate commissions could have an effect upon interstate commerce because the transaction that results from successful marketing efforts often involves the use of out-of-state mortgage lenders or insurers. The result of artificially inflated real estate brokerage fees raises the total cost of closing. This real estate transaction, in turn, affects interstate commerce in mortgage lending and insurance. Although a real estate transaction tends to be local in nature, it can have an effect on interstate commerce and is subject to antitrust action. The literal language of the Sherman Antitrust Act would seem to prohibit every contract, combination, and conspiracy in restraint of trade. Early Supreme Court decisions seemed to agree with a literal reading of the statute. In the 1911 case of United States v. Standard Oil Corporation, the court created a new standard that is known as the "rule of reason." This standard prohibits those concerted actions that cause an "unreasonable restraint of trade." Nevertheless, the courts have subsequently held that certain conduct is so anti-competitive that it is not to be judged by the rule of reason standard, but is to be deemed illegal "per se." If a particular practice is found to be within the "per se" category, the antitrust laws do not allow any evidence, justification, or excuse to be presented in defense of the violation. It is simply enough to find a violation of the act if an individual or business entity is found to have participated in the conspiracy. In the real estate brokerage business, most civil and criminal litigation has centered around three challenged practices, which if successfully proven, constitute per se violations of the Sherman Antitrust Act. The three challenged areas of practice are price fixing, group boycotts, and tying arrangements.